For some time now, Samsung has used a marketing approach with respect to flash media that accommodates both business and the consumer. 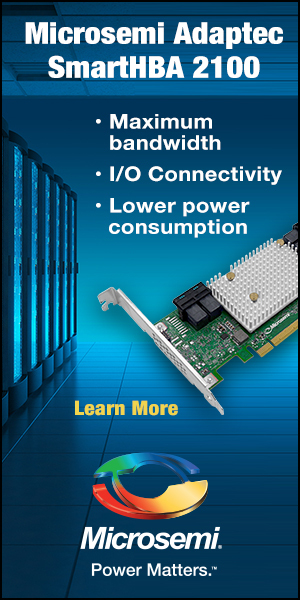 They produce the Pro M.2 NVMe SSD series for business and media needs and the EVO M.2 NVMe family for consumer use, and at a relatively modest price point. One has top performance and the other…is a bit more value conscious. The Pro line uses their 2-Bit V-NAND MLC memory while the EVO line combines 3-Bit V-NAND MLC (TLC really) with Samsung’ TurboWrite technology. 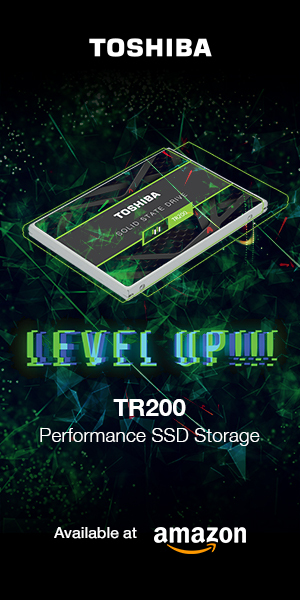 Both the Pro and EVO lines have seen a great deal of success and are easily recognized as a staple in the SSD community. We just published a Samsung 970 Pro NVMe SSD review right along side this report and the 970 Pro is destined to stand beside that 960 Pro as an industry leader. My peers may hang me for using these words but I believe the 970 Pro to be the worlds best. So what about the Samsung 970 EVO? Traditionally, it has been priced well and has seen great sales and, as much as we aren’t able to pinpoint any specific attribute that makes it a champion, its combination of build, speed, pricing and warranty have generally carried it very well. 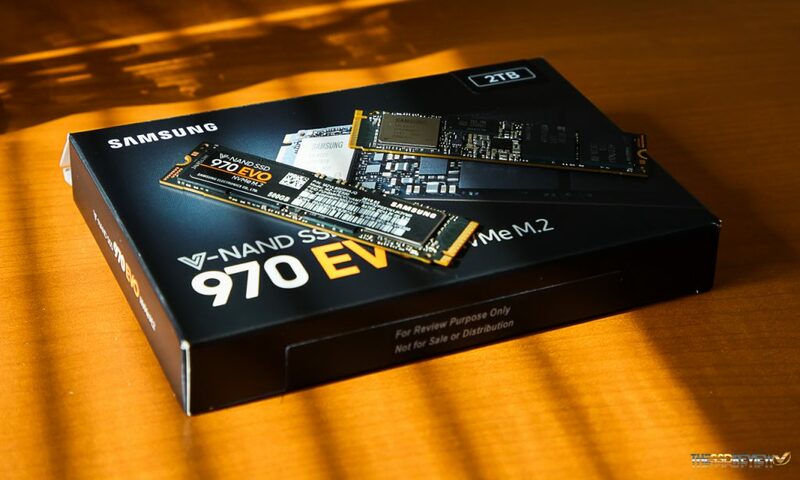 Today, we are reporting on both the 2TB and 500GB capacities of the Samsung 970 EVO M.2 NVMe SSD. Perhaps this latest release will show something of a surprise…something unexpected…maybe a bit of a new direction? 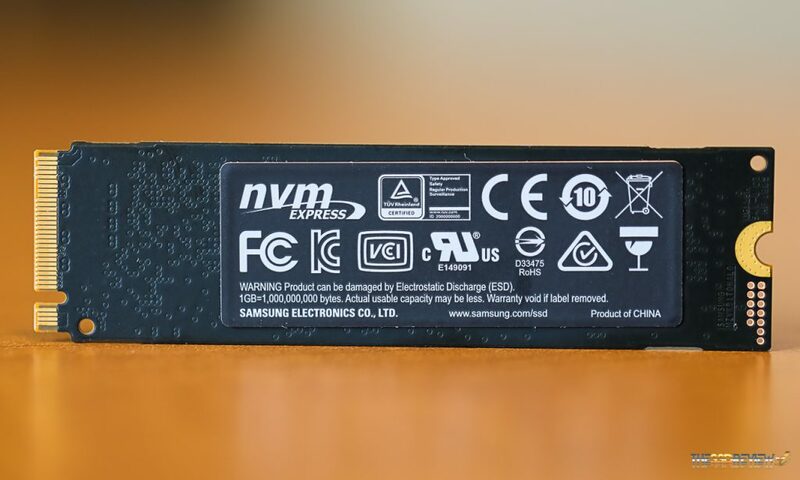 The Samsung 970 EVO NVMe SSD will be available in 250 GB, 500GB, 1TB and 2TB capacities, and is a PCIe 3.0 X4 NVMe 1.3 M.2 SSD of the 2280 (80mm) form factor. Its performance is listed as a 30% increase from the previous generation at 3.5GB/s read and 2.5GB/s write and up to 500K IOPS read and 480K IOPS write for the 2TB capacity with specifications dropping a bit as capacities decrease. (250GB – 3.4/1.5/200K/350K; 500GB – 3.4/2.3/370K/450K; 1TB – 3.4/2.5/500K/450K). Power consumption is listed at 6W read/write for the 2TB sample we are testing today with a minimum of 5mW DEVSLP. The 960 EVO has AES 256-bit Full Disk Encryption with SED (self-encrypting drive) technology. MSRP is $119.99 (250GB), $229.99 (500GB), $449.99 (1TB) and $849.99 (2TB) for release on 7 May 2018, and the 970 EVO warranty is five years or 150, 300, 600, and 1200 TBW (Terabytes Written)for each capacity consecutively. Watch Amazon for the Samsung 970 EVO. The Samsung 970 EVO contains Samsung’ newest Phoenix NVMe controller which stands out on the drive as it is nickel-plated. This nickel plating, along with heat spreaders and integrated copper film, helps dissipate heat much more efficiently. It is supported by Samsung’ DTG (Dynamic Thermal Guard) technology which will throttle the SSDs performance to prevent overheating, damage to components and loss of data. More effective heat dissipation prevents higher temperatures, over heating and thermal throttling. We can validate that, even during heavy load testing in a steady state environment, there are no heat concerns whatsoever with the Samsung 970 EVO. 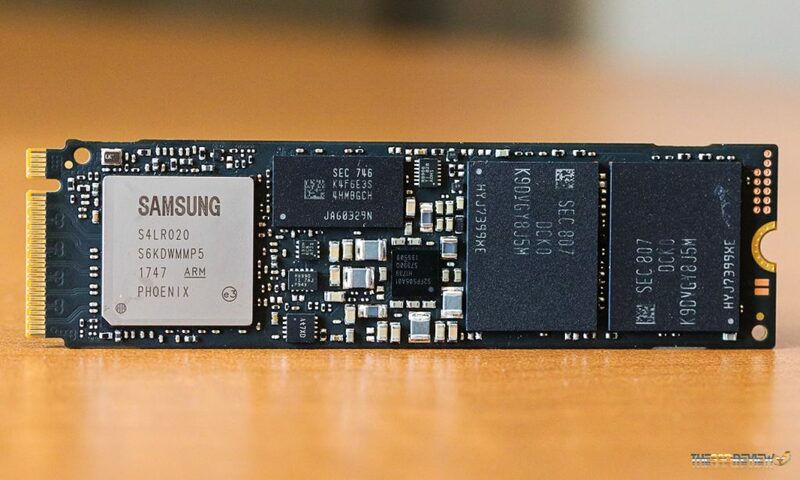 On the right side of the SSD are two chips of Samsung’ newest 64-Layer 3-Bit MLC V-NAND memory. 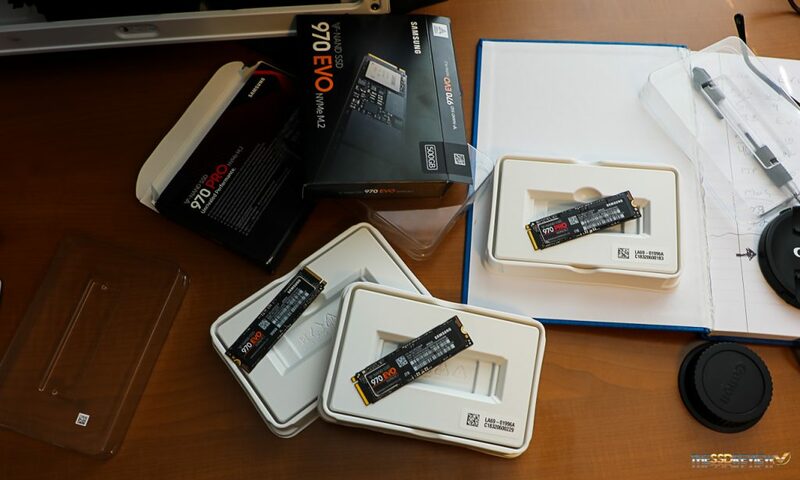 As this sample SSD is 2TB, each of these chips has a 1TB RAW value with a total drive formatted volume of 1863GB. This SSD is a single sided SSD. There is also a single LPDDRL4 DRAM package at the upper center of the SSD which may be 512MB-1GB, depending on the capacity of the SSD. We fully expect this SSD be recommended to the tech savvy and gamers, but Samsung also approves its use for high workload environments and professionals involved in video creation and editing. 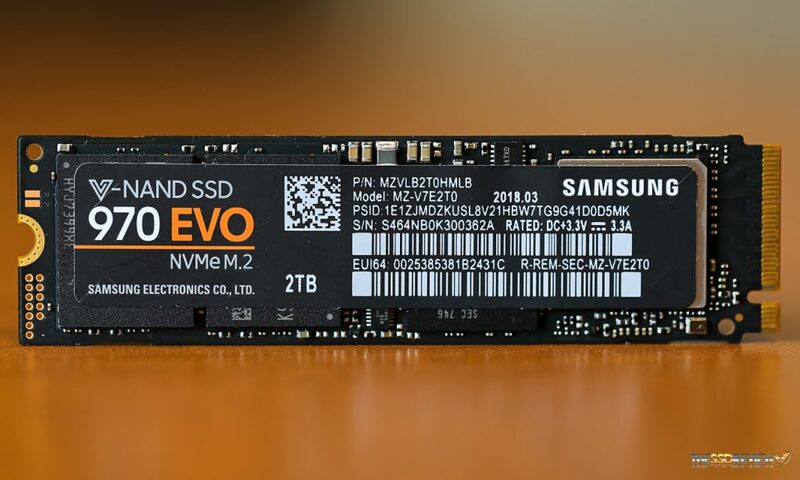 So we see… the EVO has evolved much further than a typical consumer level SSD, much in part to its use of Samsung’ TurboWrite Technology specific to the EVO.